2. 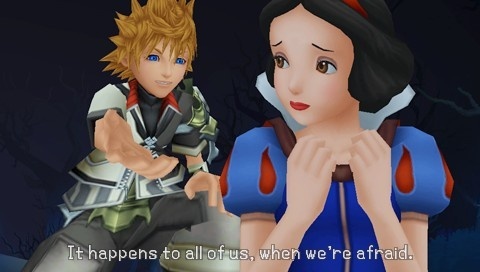 Let's see: Ven protects and comforts her when she's frightened; her canon love interest does the frightening by sneaking up behind her and interupting her song at the well. VEN WINS. 3. Both are pure-hearted, sweet, cheerful characters. Surrender to the cuteness. 4. She got really upset when the Dwarves tried to kick Ven out of the house! Awww! 5. ...well, why do YOU think the Dwarves hated Ven so much, even after Snow White explained that he was a nice guy? 7. He accidentally got her poisoned after he found the Wicked Witch's apple, proving that even the fluffiest of couples can have a healthy dose of angst. 9. Seriously. The Prince doesn't even HAVE A NAME. And so, when Terra escorts Cinderella to the royal ball, Ven can be right behind him with a date of his own! WELCOME PEPPERMINT TEA! You bet they are! And everyone knows who Snow White's REALLY thinking about when she sings "Some Day My Prince Will Come!" Ooo, good point! I'll add that to the list! Also, so what if the Prince has a lovely singing voice? Ven is voiced by Jesse McCartney. He doesn't just have "One Song," he's got dozens, including "Beautiful Soul" and "Because You Live." Ven, game, set, match. Not MY innocent Ven-Ven! I refuse to believe it!!!! Then again, he DOES refer to Aurora as the most beautiful woman he's ever seen. That's exactly why; he's a curious thing. So much for Snow White to be the fairer of them all. I guess it's a good thing the Evil Queen's mirror only works inside her own world, eh? Evil Queen: ...I lost to YOU?! Virg, would you like to join this fine establishment? Ironically, that's why I can't ship Ven/Aurora. It reminds me too much of Edward/Bella. "Hey girl of my dreams, I like to watch you while you sleep at night! You don't mind, do you? :3"
Yes, but the three good fairies had to yell at him to get him to stop looking! O_O I think Bella could've used a Flora, Fauna, and Merryweather herself, but then Twilight would've been a very short saga. True, true, but then again, Ven hadn't been looking very long, and if his personality is any indication, whatever intentions he may have had were certainly pure. Ven and Snow White should have a whistling duet. They can whistle while they work! And that'll never happen, because Snow White's too sweet, kind, and pure! :3 Actually, that's why I think she works better with Ven, Terra works better with Cinderella, and not the other way around. Snow White's too innocent for a darkness-battling Terra, wheras Cindy, while definitely pure and kind, comes off as more mature and aware of her situation.